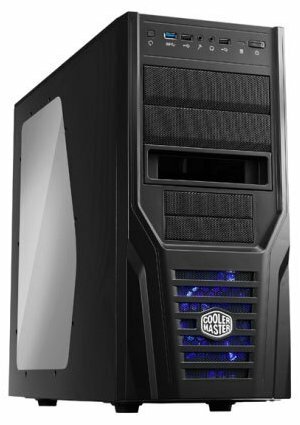 Cooler Master introduces the Elite 431 Plus, a new $59.99 mid-tower case. Cooler Master, an industry leading chassis, thermal solution, power supply, peripheral, and accessory manufacturer, today announced the Elite 431 Plus. This new mid-tower case brings premium case features to a mainstream price and design. The Elite 431 Plus focuses on a classic subdued outlook with clean and attractive lines. A large windowed side panel is included to allow others to admire your new build. In addition, accent lighting from the front 120mm blue LED fan provides an extra touch to the overall look. The Elite 431 Plus is the perfect choice for DIY computer projects on a budget. It is constructed primarily of high quality steel that lends to its strength and long-term durability. It is engineered to make it possible to upgrade to high-end components at a later date. Long graphics cards such as the AMD Radeon HD 6990 or NVIDIA GeForce GTX 580 will fit with ease. The Elite 431 Plus also supports larger CPU Coolers such as the Cooler Master Hyper 212 EVO. Easily configure the case as a home server or workstation with five 3.5” HDD bays. Enjoy the blazing speed of USB 3.0 included in the front I/O panel connections and a convenient 5.25” bay X-dock that allows you to dock a 3.5” HDD quickly and safely. This X-dock can be removed if all three 5.25” bays are needed for other purposes. Properly cooling components is a high priority in the Elite 431 Plus. Despite its smaller mid-tower size, it includes support for up to a 140mm front fan, two 120mm top fans, one rear 80, 90, or 120mm fan, and one bottom 80, 90, or 120mm fan. This setup provides optimal access to fresh cool air for system components. The Elite 431 Plus will be available for $59.99 in December 2011.